It’s hurricane season, which means something very different for Florida residents than it might for other states – even other coastal ones. Floridians are especially likely to be forced to evacuate due to hurricanes and natural disasters, and all those drivers on the road can pose some serious problems. You never know when you’re going to be an accident. You never know when you’re going to be stranded. In a recent article, the Sun Sentinel recently highlighted this need to be prepared for danger when it reported that a woman was forced to evacuate her apartment building because there was someone shooting at people in the complex. First, your bag should have wheels so you can roll it. It should also have supports such as straps so that you can use the bag as a backpack. The contents of the emergency bag should allow you to survive for up to three days. Food and water. On average, each person needs about one gallon of water per day. Food should be non-perishable so it won’t spoil. Include a can opener, silverware, and plates – even makeshift ones – for your food, so that you don’t have to eat out of cans. Protein bars and other easy-to-eat pre-packaged items are good, too. The bag should also include water purification tablets, just in case. Personal effects. You’ll need a spare set of eyeglasses. If you use contacts, you’ll need a solution. Include toothbrushes and toothpaste, baby wipes and floss, as well as anti-bacterial hand gel and dry shampoo; you don’t want to waste your water on washing your hair. If you have babies, pack extra diapers, rash cream, and formula. Have all your medications and prescriptions in a pill box or safe container. You should also consider adding OTC items such as aspirin or allergy pills, just in case. Include spare underwear and shoes with rubber soles. Since you may be outdoors, be sure to pack a hat or some kind of protective head gear. While Florida is fairly warm year-round, it does get cold at night – so bring along a sweater or jacket. First aid items. 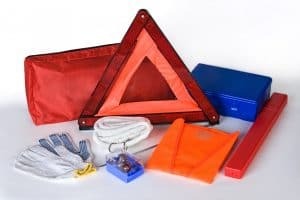 A well-stocked emergency bag includes a flashlight and batteries, a whistle, heavy tape, and a waterproof container. The batteries should be separate from the flashlight, so they don’t corrode. It should also include bandages, alcohol wipes, gauze, and antibacterial ointment. Communication items. A hand-crank radio can keep you from having to turn the car on to get news, but you should pack a wireless phone charger, as well. This way, you can keep your phone on while you wait for help. The actual prescriptions for your medications. You might want to encrypt these. Since your cell phone may not work, you should have a written list of important phone numbers. Pack blankets in case you end up seeking a shelter. If you have a pet, you’ll need a transport carrier, pet food, a water bowl, and a leash. It’s good practice to notify a shelter in advance (if possible) that you’re bringing your pet. Pet owners should also pack their pet’s vaccination records. While good preparation can reduce misery, it can’t eliminate the emergency. We urge you to put your safety first at all times. The experienced Fort Lauderdale personal injury lawyers at Yeboah Law Group are ready to help determine if you have a legal claim. For help now, please call us at (800) TELL-SAM or use our contact form to schedule an appointment.